When Windows 10 gets wonky, there's a whole set of activities to try and set things right. If approached in the right order, the time required to restore a system is seldom more than half a day and often less than that. Though it's showing itself to be a good operating system (in line with Windows XP and Windows 7), sometimes a Windows 10 system will start misbehaving to the point where repair is needed. This often takes the form of worsening performance or stability and can originate from damage to or loss or corruption of Windows system files typically found in the C:\Windows folder hierarchy. When that happens, users would be well advised to break out the following routine to help them set things back to rights. The amount of time and effort required for each step goes up incrementally. Some steps involve additional work to restore the prior state of your PC more or less back to where it was prior to taking that step. Thus, the most important bit of advice I can dispense for those who must venture beyond Step 1 is this: Make a complete backup of your system to provide a source for files and information that might otherwise go missing. Ignore this advice at your own risk. Back it up before you lose it! Anytime you make major changes to a Windows system, such as installing a major application suite like MS Office or performing an OS upgrade or repair, it’s a good idea to begin that process with a complete backup. You can use the built-in Windows backup tool (instructions for doing so are covered in my CIO.com article: “How to use Windows 10 backup and recovery features”), or you can work with any number of excellent third-party utilities (I’ve used the fee-based Acronis True Image package for years, and the mavens at TenForums.com always recommend Macrium Reflect as a good free backup utility). The important thing is to use a backup tool like one of the aforementioned that creates an image backup of your boot/system drive. That will allow you to rewrite that drive and restore your system to normal operation should anything go wrong with your changes or repairs. That’s just what you want! To quote TechNet, the system file checker "scans and verifies versions of all protected system files." It can tell you if it finds anything amiss if you enter SFC /scannow at the command line. You must run this utility from an Administrator: Command Prompt (press the Windows key-X combination), and then select Command Prompt (Admin) from the resulting pop-up menu. This command takes 5-10 minutes to complete, depending on your PC hardware. This command also attempts repairs if it finds anything that needs it. Figure 1 shows some sample output. Figure 1: When SFC finds a damaged file it attempts to replace it with a good copy. If SFC determines that a protected file is damaged or changed, it grabs a correct version of the file from the C:\Windows\system32\dllcache folder and replaces it with a good copy. SFC can even attempt to repair that file cache if it finds changes or damage there, too. See the TechNet SFC reference for complete information on this command. As with SFC, you must also run DISM in an Administrator: Command Prompt window. The /checkhealth command simply checks the running image (that's what /online tells it to do) to see if it can detect any damage or corruption. Because it's only checking file hashes and signatures, this command completes in under one minute on most machines. The good thing about /check is that it not only tells you if it finds damage but if that damage is repairable or non-repairable. If it's repairable, you can proceed to the /restorehealth option (covered in the next paragraph); if it's non-repairable, jump to Step 2. Figure 2: Breathe a sigh of relief if DISM finds no corruption in the component store; otherwise try the /restorehealth option. The /restorehealth command can be tricky to use. Because it can actually repair the Windows image, it needs a source from which to attempt such repairs. 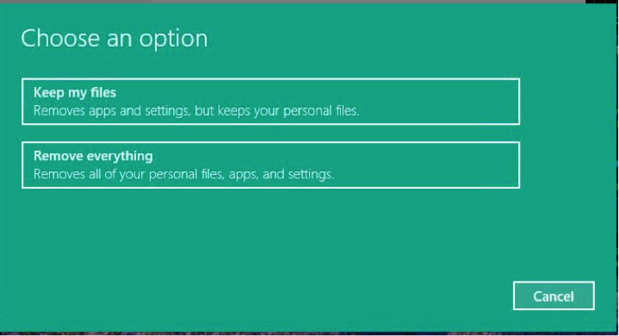 You can omit the /source option, but if you do the command will try to grab its files from Windows Update over the Internet. This may or may not work, depending on firewall settings on your network. A safer bet is to point DISM at a known good source for Windows image components on the local machine (or on your local network). This can be a Windows image (.wim) file or a compressed Windows image (.esd, which is used for electronic software downloads of Windows installations, as the file extension is meant to communicate). You can also point to a copy of a WinSXS folder (the usual directory path is C:\Windows\WinSXS) taken from another PC with similar or identical hardware for which dism … /checkhealth returns a clean bill of health. If you run into difficulties getting this to work, try adding the /limitaccess switch to your command strings. 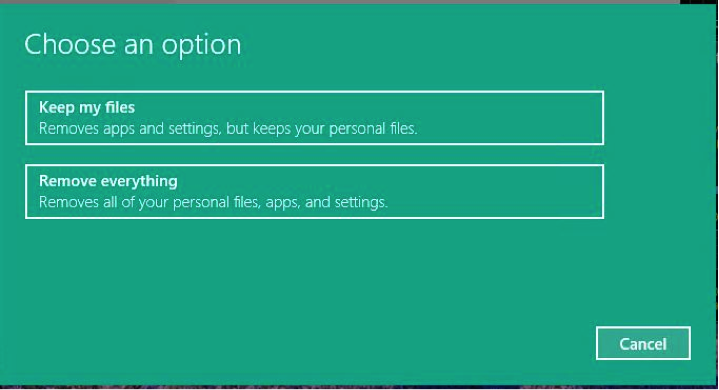 This stops DISM from attempting to grab source files from Windows Update, which it will sometimes do even if pointed at a local source. If you just can't get either of these to work, try a WinSXS folder instead. Note: the version and language for the /source image must be identical to that for the image to be repaired. This often means visiting TechBench or using the Media Creation Tool (click the "Download tool now" button) to grab a current source for the most up-to-date Windows 10 build, and creating media or mounting the ISO file, to give DISM the right /source form which to work. Figure 3: If all goes well you'll see "The operation completed successfully." In my experience, 80 percent of all problems will be solved at this point, so the odds are in your favor that you won't have to keep going. But if DISM can't or won't repair your Windows image, proceed to Step 2. 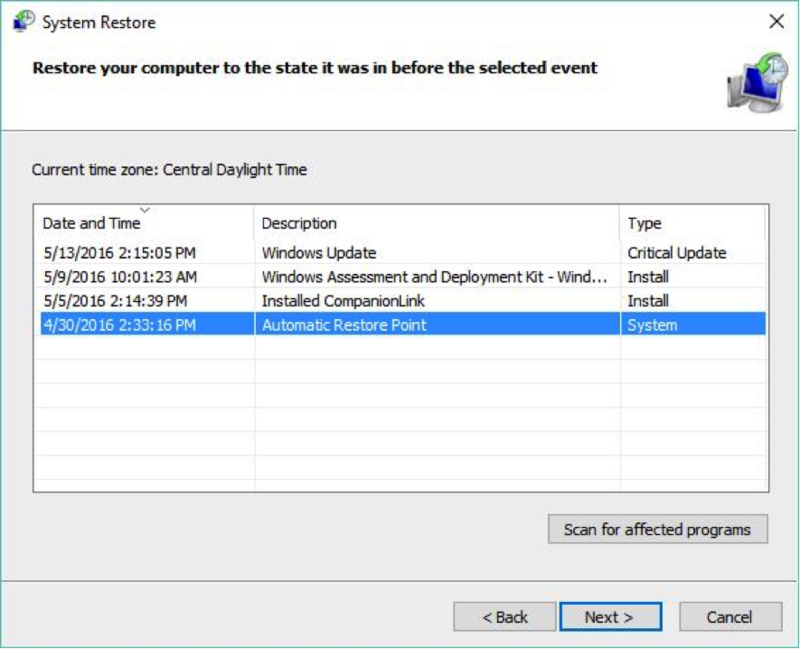 A restore point is a snapshot of a Windows PC's OS state from a specific point in time. If enabled, the Windows System Restore capability can create and maintain restore points on your behalf. To see if this is an option on your target machine, type "restore point" into the Windows 10 (Cortana) search box. The System Properties window should open to the System Protection tab (see below). 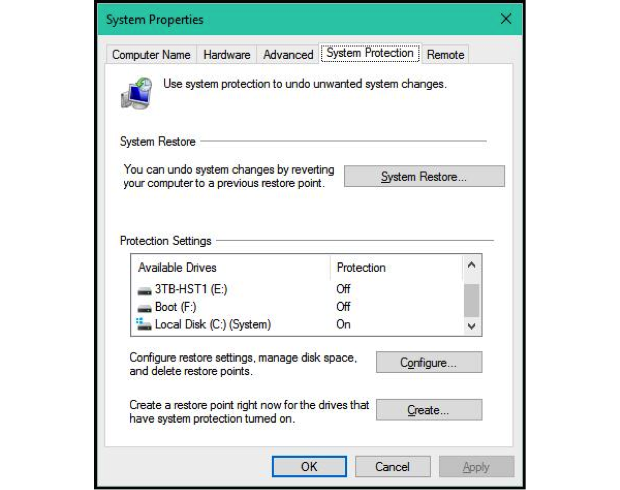 Figure 4: Available restore points may lurk behind the "System Restore" button shown here. 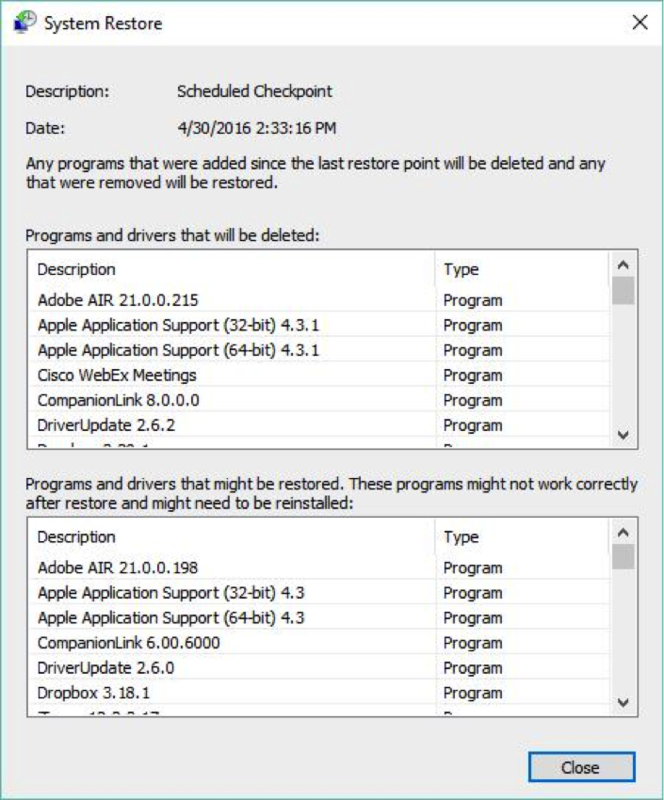 To look at restore points, you must work through the System Restore wizard. Click the Next button on the first pane of the wizard to see a list of restore points available to you. (If you don't like what you see, or you don't see something from before your troubles started on this machine, click the "Show more restore points" checkbox for a complete list of what's available to you.) Then click the restore point to which you would like to revert. Figure 5: The oldest restore point showcases what happens when you roll further back in time. In capturing the screenshot for Figure 5, I picked the oldest item to show what happens when you roll that far back in time. If you then click the "Scan for affected programs" button, the results show everything that would be undone by restoring your PC to that snapshot. In this case, there's a long list of items to ponder (further examination shows two dozen items including programs, Windows updates and device drivers). Figure 6: Items dropped include new programs, updates, apps and device drivers. It usually takes between five and 15 minutes to revert to a restore point. The amount of additional effort to catch back up depends on the number of items in the list shown in Figure 6. This can take anywhere from a few minutes to an hour or more depending on size and scope. You'll need installation media for the same edition (Home, Pro, Enterprise or Education), language (en-US for American English, for example) and build as the currently installed edition. Likewise, bittedness must also be identical (32-bit media for a 32-bit install; 64-bit media for a 64-bit install). I recommend building an installable and bootable UFD (USB Flash Drive) for this purpose because you may need it again sometime (there's a great TenForums tutorial on how to do this). Before launching into this process, most experts also recommend that you turn off Fast Boot and Secure Boot in your UEFI firmware settings (if turned on). Performing an in-place upgrade is easy. 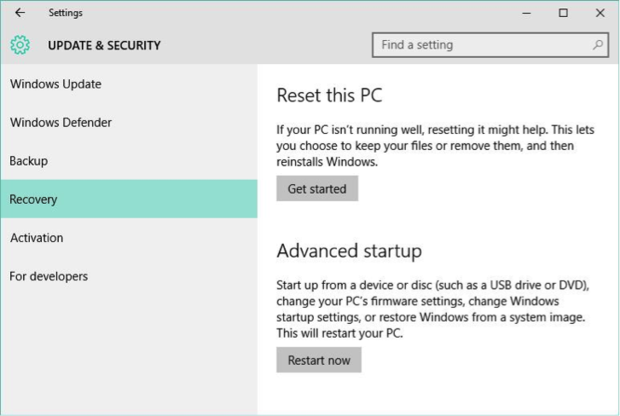 Make sure to log in to Windows 10 with an administrative account and then disable or uninstall any third-party antivirus or security software that may be running (anything other than Windows Defender, in other words). Next, run setup.exe from the UFD, or from the mounted ISO, which should reside on some drive other than the system/boot device. When the Windows installer gets going, accept the license terms, select “Upgrade this PC now,” allow updates and click “Next.” Windows 10 grabs updates, switches over to the installer OS image and gets itself ready to run. You must then accept the license terms and allow the OS to start the actual in-place upgrade. By default, the installer keeps all personal files and apps on the target machine. This is what you want so there's no need to dig into the "Change what to keep" item on the "Ready to install" page. As the in-place upgrade runs, the circular progress indicator shows it's "Upgrading Windows," from 1 percent to 100 percent. After that completes, it takes you through some additional setup screens where you have the option to customize settings or take the express route to completion. Once that is complete, you'll sit through a number of colored screens as the installer puts the finishing touches on your in-place Windows 10 upgrade. The whole process takes 10 to 30 minutes, depending on your PC's hardware. You'll need to re-establish your network connection and set your time zone (unless you live in the Pacific time zone where Microsoft has its HQ). That's it, you're done! Figure 7: The Reset process is easy to start but requires LOTS of follow-up. The next screen to appear lets you know exactly what you're in for, and why a reset is properly described as "draconian" in scope and impact. Figure 8: With reset you always lose apps and settings and can either keep or toss your personal files.